The Oath is the first quest in the Two-Player limited edition starter set for Lord of the Rings the Card Game, which is a living card game by Fantasy Flight Games. 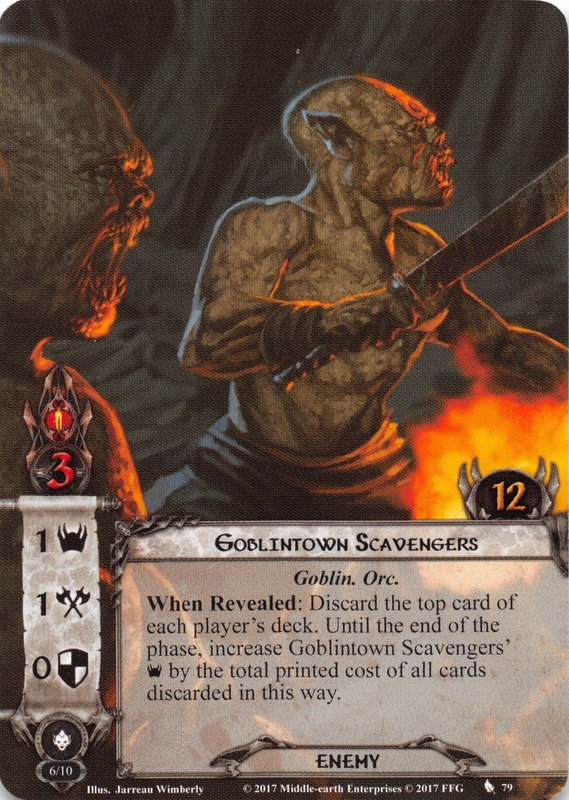 It was included as part of the Collector’s Edition for Lord of the Rings the Living Card Game, which is a digital card game by Fantasy Flight Interactive. Confused? Basically, the Collector’s Edition was a subtle way to bait the conservative LOTR LCG players into pre-ordering the digital card game. The deal was that you pre-ordered the digital game, you also a shiny two-player starter set, which the fans have argued that the game has been in need of for years. The set includes two decks in a beautiful new art style which highlights the art, which contains two brand new heroes never seen before! Additionally, the box contained two new quests in the same card frame design- the Oath and the Caves of Nibin-Dûm. As of current writing, the heroes will eventually be released, but the quests will not, which has been a fairly controversial decision among fans. The Oath attempts to create a new entry point into the game, as a modern version of Passage Through Mirkwood. Hopefully, it will be used to lure many new players into the hobby. Geographically, this story takes place in Mirkwood, in the same surroundings as the core set box. However, in this story, we are not delivering messages, but tracking a band of ravaging goblins that have raided a woodman village, and taken the villagers captive. Play if: You want a good introduction quest for new players. You want an easy quest to test decks against. You want to enjoy the fantastic artwork on the locations. What is different about this quest? : The encounter cards! The difficulty if you are tired of getting brutalized by newer quests. Solo or multiplayer? : The quest is made to play with the two decks in the box, and doesn’t offer too much of a challenge. It is certainly solo viable but is a good candidate for two-player with a novice. Can I run side-quests for this scenario? : Certainly. The quest allows you to progress at your own pace. What to look out for? :The encounter deck trying to exhaust your characters through various means. Some nasty spiders punishing the number of exhausted characters. A goblin mini-boss that boosts other goblins. Quest card 1A will instruct you to set aside the Goblin troop which will be the boss of the scenario. A 3/5/3 statline is not too tough by today’s standards but can provide quite a challenge for decks that do not run a dedicated blocker. 6 hit points also means that you may not be able to deal with them in one turn, and puts the troop outside of Gandalf bomb range. Finally, they make other goblins more dangerous by adding +1 attack and +1 defense to other goblins engaged with you while goblin troop itself is engaged with you. This can mean that you become swarmed, unable to clear enemies because of higher defense. Additionally, the troop is immune to attachments, so no Forest Snare and no Ranger’s spikes. However, at this point, we are still tracking the troop so they are not of immediate concern to us. Just keep in mind that a boss fight is ahead. 1A also instructs you to fetch 1 copy of The Eaves of Mirkwood (no scaling with player count!) and add it to the staging area. While the Eaves is the active location, you cannot cancel encounter card effects (so no circumventing nasty effects with A Test of Will!). Stage 1B requires 9 progress without any Forced effects or special instructions. This is prime turtle territory and allows you to build up a board state, clear out enemies that show up, and remove locations as they appear. While the decks in the starter set have no side quests, this is ideal side quest territory, as you are not really punished for lingering, as long as you can handle the threat ticking up. Once you add the ninth progress, you move on to the next quest card with trembling hand. What terrors will the encounter deck unleash? What will you have to face? Are the goblins coming down for a final showdown or a dangerous pursuit? The answer is… No. You are given some flavour text and immediately advance to stage 2B. 2B has a When revealed effect, instructing you to search the encounter deck and discard pile for a forest location, and add it to the staging area. This is actually an important moment in the quest because if you have left a bunch of locations in the staging area already, you run the risk of getting location locked. I will go through the various forest locations below, but at the moment the main thing to keep in mind is that you need a copy of Goblin Trail in the victory display to advance. And as goblin trail is a Forest location, it is a prime target for fetching. It is by no means a trivial location – it adds 3 threat and requires you to reveal an encounter card to travel there. But when it leaves play (which requires 6 progress) you get to place those progress on the current quest (which means it can be a side quest if one of those are in play). Again, the quest does not punish you for being slow, and allows you to progress at our own pace. Keep in mind that you need not go to a Goblin trail here if you already revealed- or cleared one during Stage 1B – then you can pick a location like the Forest Gate (described below) which actually helps you. When you advance to 3A, you have finally managed to track down the goblins! Add the goblin troop to the staging area! Each other player searches the encounter deck and discard pile for a goblin enemy and adds them to the staging area. Goblins are not revealed, so the Goblin runner does not surge, and the Goblin-town Scavengers do not force a discard (both enemies are described in more detail below). Stage 3B cannot be defeated while the goblin troop is in play. Unless you for some reason have rushed through the other stages, your board states should be ready for this. Chump block the troops if you have no one that can take a 5 attack, and be ready to throw damage on them. Usual boss fight tips apply – Feint them, boost your attackers, use a Gandalf bomb or an angry Beorn with sneak attack and bring the troop down. Once they stop kicking and you place the 6th progress you have won, and found the trail to the goblin’s secret lair! The encounter deck has 29 cards in Normal mode, 21 in Easy mode, which is relatively thin. Average threat per card revealed is 1.7 threat per card in Normal mode, and 1.8 in Easy mode since some treacheries got removed. 6 cards can potentially surge in this encounter deck. There is a decent balance between all the different types of encounter cards in this scenario, with just a slightly larger concentration of enemies in the encounter deck. Enemies in this quest comes in two flavours: Goblins and spiders. The goblin troop is described in detail above, so there is no need to go more into detail about them. To defeat them, use your normal combat tricks, such as Feint, Khazad Khazad, etc. to bring them down quickly. Besides the stats the troop also buffs other goblins, of which we have several in this deck. 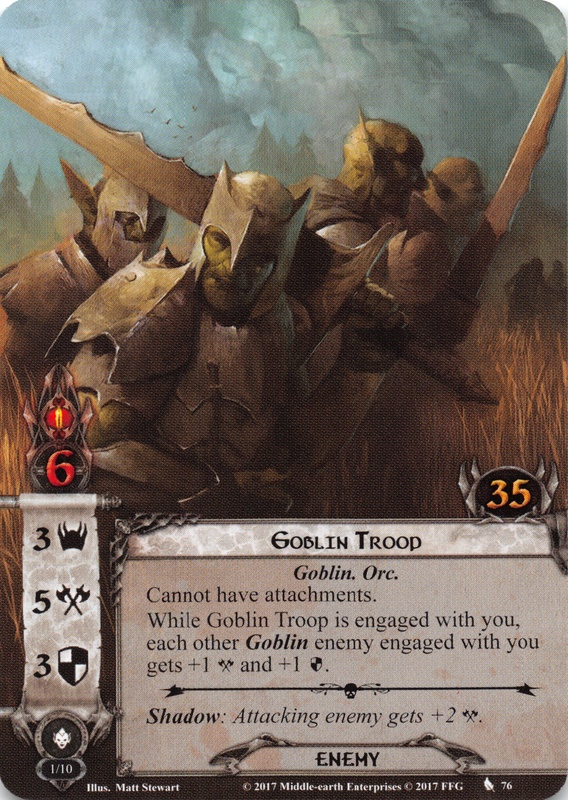 The Goblin Sniper is a LotR LCG classic and has recently seen play in the Wilds of Rhovanion box. Like an ageing rock star in need of money, Everyone’s favourite proto-archery card returns for one more round. If other enemies are in the staging area, he cannot be optionally engaged, and if he is in the staging area at the end of the combat phase, each player deals one damage to one character he/she controls. As his engagement cost is 48, he may hide out in the staging area for quite a while. With 2 threat, 0 defense and 2 attack he is a prime target for Straight Shot, Hail of Stones or one of the Engagement effects that let you draw him out. Otherwise, the most effective tech against him is to keep the staging area clear of enemies. We also have the Goblin Runners, an aggressive enemy with an engagement cost of 20, surge, and 1 threat, 3 attack, 1 defense and 2 HP. Especially the 3 attack can be tough in the early game if you have committed all your characters, as you will likely engage him right away due to the low engagement cost. He also has the classic horrible shadow effect of causing an additional attack, which can be deadly when granted to the spiders or the goblin troop. His weak defense and low hp make it unlikely that he will stay around, but he can cause plenty of damage, especially if he gets the +1 attack and defense buff from the troop. Lastly, we have the Goblin-town Scavengers, coming down, down from Goblin-town to ruin your day. Again, stats are meagre. 1 threat, 1 attack, and 0 defence, with 3 hp. Even with the buff from the troop, they will not be much of a challenge. When the Goblin-Town Scavengers are revealed, each player discards the top card of their decks, and the total cost of these cards is added as threat to the scavengers until the end of the round. If you quest cautiously and are deliberately trying to hold back from advancing, this can lead to a rather large threat increase from questing unsuccessfully, particularly at higher player counts. This places the player in an interesting dilemma: Quest hard, bearing in mind that this can cause you to advance (and therefore face the goblin troop faster) or hold back, risking a threat increase. A specific tech for this is Radagast’s Cunning which allows you to ignore the threat of an enemy for a round – very nifty against the scavengers. With an engagement cost of 12, they will not linger around in the staging area for long, and will engage players in the same round they appear. The final two enemies in the encounter deck are a bit more spideresque than the goblins. The first is the aptly named Great Spider with an engagement cost of 34, 2 threat, 3 attack, 1 defense and 3 hit points, which exhausts a character you control when it engages you. This can be devastating if you quest and hold back one chump blocker, or have one dedicated defender. If you have a large ally swarm, this may not mean much. Hero readying (Cram, Unexpected Courage, etc.) is of course very advantageous. The presence of this guy in the encounter deck means that it may make sense to wait with readying effects until after the combat phase has begun – that way, a possible attacker will not be exhausted following engagement. His shadow effect can be annoying (deal 1 damage to an exhausted character) but shouldn’t matter too much unless your board state is in trouble, and your defenders are close to death. Final enemy is the Spiders of Mirkwood and even though you are hunting the goblin troop, these guys might be worth saving that Feint for. An engagement cost of 18 means you have to deal with them straight away, and with 3 threat, 2 attack, 2 defense and 4 HP they are not trivial to deal with (though 4 HP means they can be Gandalf bombed!). However, the spiders get +1 attack for EACH exhausted character the engaged player controls. In a swarm deck this means that the Spiders MUST be chump blocked or feinted. Strike hard, strike fast and don’t look back. Otherwise, you will be dead. The shadow effect is also nasty, exhausting a character (likely the character you planned to use for attacking) and dealing 2 damage if the attack was undefended. There are only two of them in the encounter deck, so hopefully, you won’t see too much of them. All locations in the encounter set are forests and can, therefore, be picked as viable targets during stage 2a. Having every location with the Forest trait also helps Rossiel players to get that bonus willpower sooner. The Eaves of Mirkwood got covered briefly in the setup section. With 2 quest points, it is a prime Asfaloth target or a good target for The Evening Star. Bear in mind that the effect on Eaves only is activated when Eaves is the active location, and hence it is preferable to deal with it while it is in the staging area. Tangled Grove is a location which either will be a relief to see, or make a building location lock much, much worse. It adds threat equal to the number of locations in the staging area, and can, therefore, be problematic if you get prevented from clearing locations. With having 3 quest points, it cannot be removed with Asfaloth in one round and should be a travel priority if it shows up. However, as each player must discard a card at random to travel there, it may be preferable to deal with it through location control rather than travelling there. Forest Gate adds two threat and requires 4 quest points to clear. But it also has a nice response, without a horrible downside or travel cost – when you travel there, the first player draws two cards! This effect almost makes this author uneasy – at this point in the game, we are used to “nice” encounter card effects hurting us in some other manner (like the quests in the Voice of Isengard box that punishes card draw). But this is a nice callback, to a time when locations could be nice. Enjoy it. you are unlikely to see it again anytime soon. Spider Den is a tough location, with 4 threat and 4 quest points. This makes it a priority for travel, to get the 4 threat out of the staging area. 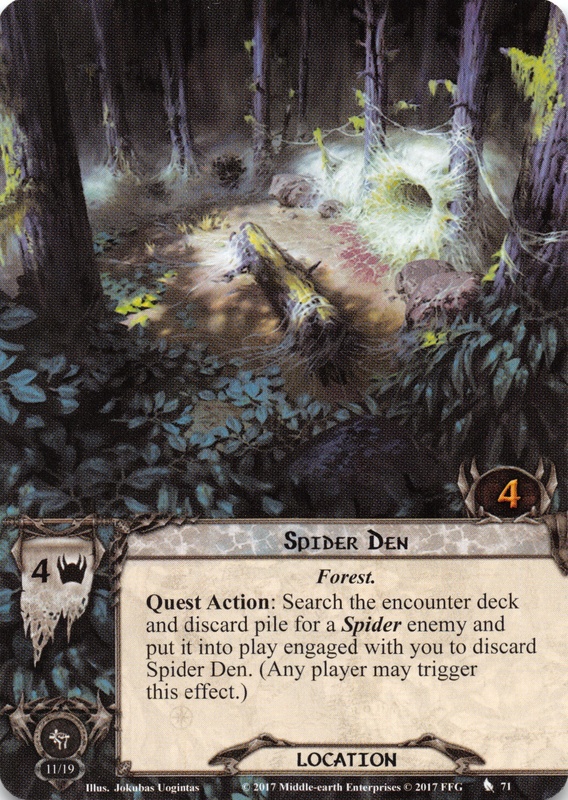 However, if you run tactics or a combat focused deck, spider den has a proposition for you: As a quest action, you can discard spider den and replace it with a spider enemy from the encounter deck or discard pile that enters play engaged with you. Note that this can be triggered in the action window following encounter card reveal, and you can, therefore, assess the situation before you discard the location. If you have the encounter deck under control, it is a nice way to remove the spiders from the encounter deck and ensure that you get them under more controlled circumstances. Ultimately, it depends on your board state. 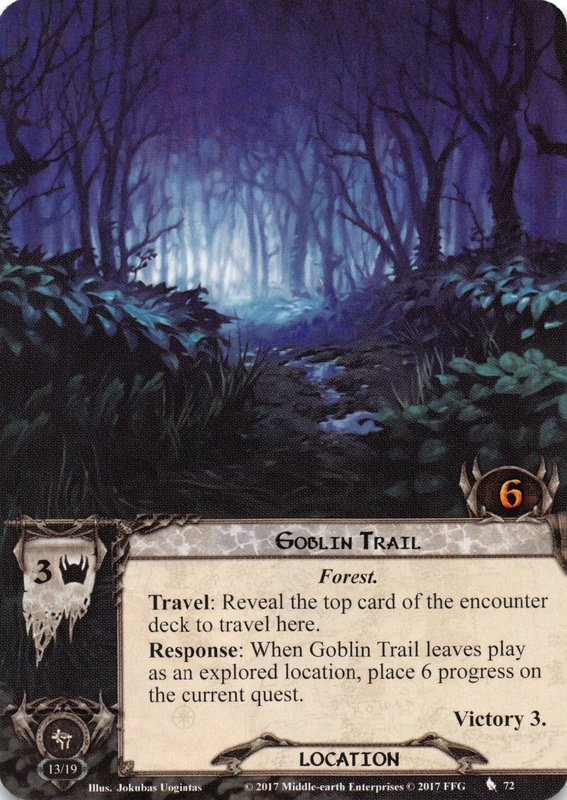 The final location in the encounter deck is Goblin Trail which is covered in depth in the section on quest 2B. This is another beneficial location which is a prerequisite to clear before moving on to the final stage. The treacheries in this quest come from a wide variety of quests in the normal quests. They range from Core Set classics to expansions as recent as Wilds of Rhovanion. There is nothing new here, but it is nice to see these old treacheries working together in one encounter deck. Driven by Shadow makes a reappearance from the core set to ruin your day when you are yolo-questing to clear the final stage. It grants each enemy in the staging area +1 threat until the end of the phase and gains surge if no enemies are in play. This effect, of course, can be brutal if you are trying to clear something for the win, but should mostly be something you can endure. 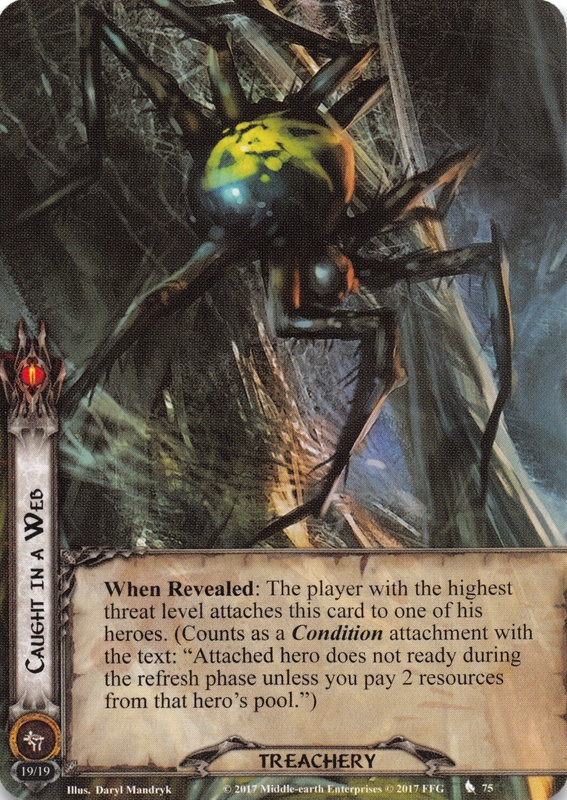 It is much worse to see as a shadow card – the defending character discards an attachment (which is particularly bad if your defending character is defending a buffed up spiders of Mirkwood). And if the attack is undefended, all attachments controlled by the defending player is discarded. Those lowly goblins that attack for 1? That attack may wreck your board state in one swoop. Shadow cancellation can, therefore, be gold in this quest. Keep an eye on the number of this card in the discard pile – there are two in the encounter deck. Surprising Speed from the Lost Realm is also here to disrupt your plans. It causes each player to return one enemy engaged with him/her to the staging area, which can cause the threat in the staging area to increase by a lot (particularly at higher player counts). However, unless you play traps or are in trouble, this shouldn’t be too bad – you should ideally aim to clear enemies engaged with you each round, otherwise the encounter deck may get the upper hand. This can be annoying, but shouldn’t be worthy of A test of will at most times. If no enemies are returned, the card gains surge and Doomed 1. The shadow effect prevents counter attacks, and grants the enemy +1 attack, and returns it to the staging area afterwards. Annoying, but most of the time not lethal. Save the hasty strokes for Driven by shadow. Goblins are upon you! is originally from the Battle of the Five Armies quest from the Hobbit, and causes each player to search the encounter deck and discard pile for a goblin enemy to engage. This can actually be beneficial, as it allows you to remove the Goblin runners from the encounter deck, negating their surge keyword. Of course, if you are getting swarmed by spiders this can be annoying. 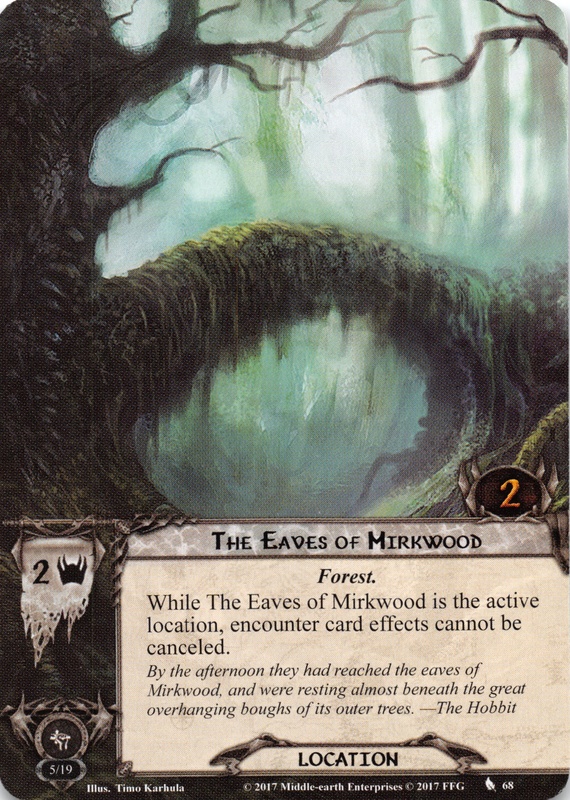 The card cannot be cancelled, making the effect on Eaves of Mirkwood rather pointless if it happens to be the active location. As a shadow card, it grants +1 for each goblin enemy engaged with the attacked player. As goblins are rather puny, you shouldn’t have too many of them lingering around, but if you have a few in forest snares, this can come back to bite you. Eyes in the dark is a new treachery from the Wilds of Rhovanion box. It has Doomed 1 and gives each player a choice: Either raise your threat by 1 for each questing character you control, or discard a questing character you control. What option you choose is, of course, dependent on the specific phase of the game – in the early game a few points of threat may be trivial, and in the late game when your Dale swarm is blasting through, you might have to discard a cheap ally to avoid threating out. This treachery makes it worthwhile to include a cheap ally in your questing team so you won’t have to discard an expensive ally or a hero. The shadow effect is another reason that it is dangerous to take undefended attacks – if the attack is undefended, you have to discard an ally! So if you can, block those small goblins rather than taking an undefended attack. Caught in a web is another core set classic that targets the player with the highest threat level. This player attaches Caught in a web as a condition attachment, which prevents heroes from readying during the refresh phase unless 2 resources are paid from that heroes pool. All condition attachment removal is valuable here, as this essentially negates a hero. Interestingly, only ally Elrond is present in the two-player starter set, making condition attachment removal rather limited. Keep in mind that this quest is a part of a starter set and is therefore on the easier side. If you run your Caldara super deck against it you will blast through it, and you will not have a very fun time. Use it to test new deck ideas, or even better, to introduce new players to this wonderful game. It is easy, doesn’t have many complicated rules that you need to check for, and provides a satisfying narrative in the tracking of the goblins. It is truly a modern edition of Passage through Mirkwood. Keep your eyes on the number of exhausted characters – the Spiders of Mirkwood can get really nasty in their attacks. If you need to exhaust a lot of characters to quest and have a big Spiders of Mirkwood looming, don’t be afraid to chump block. No shadow card effects punishes attacks that destroy characters, so throw those Squires of the Citadel under the bus! Be extremely careful about undefended attacks! Several shadow card effects have severe punishments when you take undefended attacks so it is better to chump block most of the time. As there are is no punishment for lingering at stage 1B, you can turtle to your heart’s desire. Side quests are highly recommended! You have tracked the Goblins to their lair in the Mountains of Mirkwood. Next time, you will dive into the caves of Nibin-Dum and try to rescue the captured villagers.